The V.A.P.R series of Titanium suppressors was designed and built for hunters, by SRT Arms in collaboration with O’Neill Ops. Available in .224, 6MM, 6.5MM, and 7MM. These caliber specific suppressors may fit your requirements if you decide sub-caliber use of one of our SHADOW series .30 caliber suppressors is not ideal for your needs. 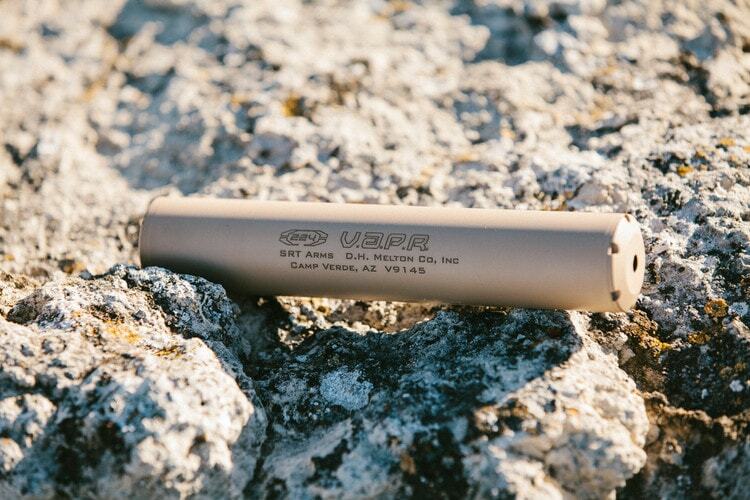 These suppressors were optimized for maximum sound reduction for each cartridge group. .224 V.A.P.R. was designed specifically for the 22-250, and to withstand any .224 caliber round you can put through it, being a host on several calibers which have included but are not limited to, the 223 WSSM, 220 Swift, 22-250 AI, 22-250, 223 AI, with no cold, first shot POI deviation. Any general POI shift will be straight down, and will depend on barrel length and barrel profile. 6MM V.A.P.R. Designed for use with 6 MM Remington, 6 MM BR Remington, 243AI, 243WSSM, 6XC, 6creedmore, 6 Compmatch, and other variants. 6.5 MM V.A.P.R. Designed for use with 260 Remington, 6.5 Creedmore, 6.5 Sherman Short, 6.5 SAUM and others. 7 MM V.A.P.R. Designed for use with the 7 MM Remington magnum, and other .280-.284 caliber cartridges. Grade 9 Titanium seamless aerospace hydraulic tubing is used for the tube. Baffles and end caps are machined 6AL-4V, the blast baffle is machined from 718 Inconel on the .224, and 6MM, and 316 SS on the 6.5 and 7MM, that is suited for use in extreme environments subjected to pressure and heat, it will give you a lifetime of service. The V.A.P.R series is the first Suppressor researched and developed by a team of predator hunters, designed, tried and proven for our need in the field. The V.A.P.R. series is available exclusively through O’Neill Ops as the distributor, contact O’Neill for pricing.